Born in Yokohama to a U.S. serviceman stationed in Japan after World War II, the young Ivey and his family often moved from one state to another before settling in North Louisiana during his high school years. Upon graduation, he studied graphic art at Louisiana Tech in Ruston, did a stint in the Navy, returned to North Louisiana to marry the girl back home, and launched a 35-year career as a graphic artist, illustrator and editorial artist for newspapers, magazines and advertising companies. During that time his designs and illustrations have won numerous regional and national awards from the American Advertising Federation. In 1984 he was selected as the official artist by USA’84, the marketing sponsor for the United States Olympic Committee. Over a span of thirty five years while working as a designer and illustrator he began to explore painting as his creative diversion. Since 2008, he has developed an insatiable desire to paint daily. Receiving instruction from noted painters Michael Dudash, Michael Workman and Fredericksburg Art School. While attending Plein Air Workshops at the Scottsdale Artist School sparked even more motivation on his path of expression. By exploring various visual approaches, Dave feels that he is developing as an artist which isn’t limited to just one approach. The discoveries he makes along the way are what fuel his desire to paint. Dave’s paintings have received numerous awards in regional and national shows and has work hanging in private collections throughout the United States, Canada, Puerto Rico and Europe. His paintings grow out of the southern rural life he and his wife enjoy close to their home in the country, where they are surrounded by pine trees, horses, cows, and the many elements of the natural world. Dave feels he knows this world closely, and in his paintings he seeks to render seemingly ordinary aspects of its landscape in ways that reveal their extraordinary character and beauty. Dave states he does not treat his subjects in a photo realistic manner. Instead, he seeks to convey the atmosphere of a particular place at a particular time - the play of light, season, and time of day on the land and animals that inhabit it. His works show this concern for atmosphere through looser brush strokes and color on his palette to achieve a harmony of complementary warms and cools that permit the subtleties of the light of day. I hope those who view my paintings to do more than look at them. I want them to experience God’s beauty of the world in each painting. 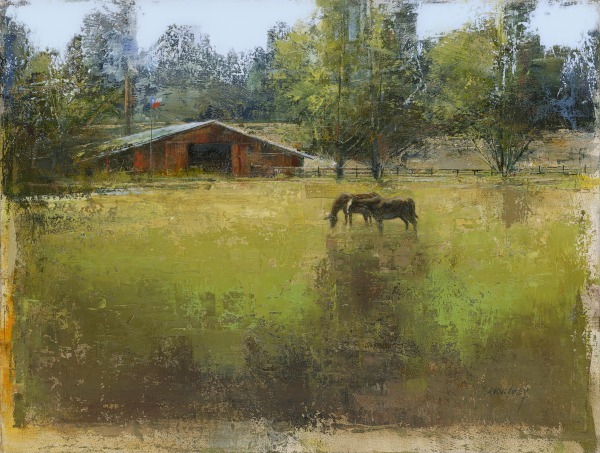 Dave paints out of his studio at his home he shares with his wife Cathey on their farm in Northwest Louisiana on the Louisiana-Texas border.